Tradition leads you to believe: start a company in a garage or basement, find a few people to tell you it’s a good idea, raise a small bit of money from your friends & family, move to Silicon Valley, raise more money from a well known VC and become a technology rockstar. Well those of us that are living and breathing this perceived narrative know that it is mostly untrue. As the founder of Trueface.ai a face recognition startup, I am overwhelmed with how often people just assume ‘the valley’ is throwing money at any face recognition or artificial intelligence (A.I.) company. It’s just not the case as the venture world has shifted their risk profile to focus more on growth investing. The history of raising money has always positioned the venture capitalist in the position of power, dictating to the market which companies have a higher chance of success. But how investors make the decision to invest is unpredictable and not always backed by real expertise in building companies. Security tokens are backed by real-world assets such as equity in a company. Like “utility tokens” they are tradable on exchanges. They allow many investors globally to buy into a promising project whether that’s investing a group of startups or a real estate project. The game has now changed for investors thanks to tokens and how they can allow for someone to instantly diversify. I can remember back to a finance class in college; we learned all about modern portfolio theory and diversification to reduce unsystematic risk. We’ve been taught, broadly speaking, to invest in the minimum number of companies necessary to drive your exposure to unsystematic risk to near zero. The number of which is accepted is 30 companies in multiple industries and different levels of risk associated. This theory is what has me incredibly excited about securitized tokens and specifically 22X Fund. 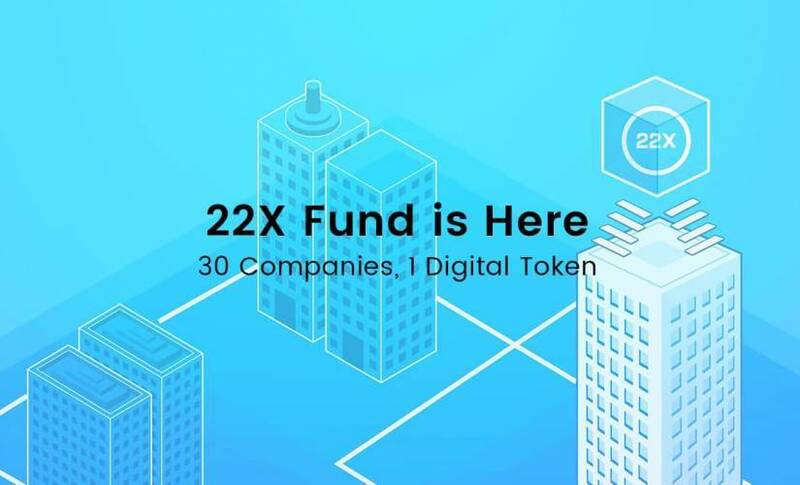 The 22X Fund is the first security token of its kind – a founder-organized initiative of 30 companies from the most recent batch of 500 Startups (Batch 22), one of the best technology accelerators in the world. The startup founders of 22X joined forces to revolutionize the way we think about fundraising. The securitized token represents up to 10% equity interest in each company, providing investors with access to Silicon Valley’s best and brightest with one single investment. The batch of 30 companies was vetted by the 500 Startups organization and had previously raised over US$ 22,000,000 in capital to get to the stages they are at today. Investors within the 22X Fund gain access to 30 high growth companies with one investment and can reduce their overall risk while having access to liquidity by trading the token as they see fit. There are incredible benefits to both sides here – the founders of the companies have access to global capital ranging from smaller private investors overseas, to family offices to traditional institutional funds. The 22X Fund empowers its founders to spend less time raising money and more time focusing on how to grow their business and be successful. Although I still believe the venture capitalists play a critical role in the ecosystem, it reduces their power to be the final say about who has an opportunity to be successful. It democratizes startup investment. The long-term implications for the relationship between traditional venture capital and founders are still up in the air, but I think for the community this is an incredible step forward. Silicon Valley is known for its forward-thinking, risk-taking and against the grain mentality. This new type of fundraising is precisely what should be expected from incredibly driven, determined and bright founders who are willing to take risks. Editors Note & Disclaimer: TrueFace.ai & its parent company Chui are alumni of the ReadWrite Labs accelerator program.